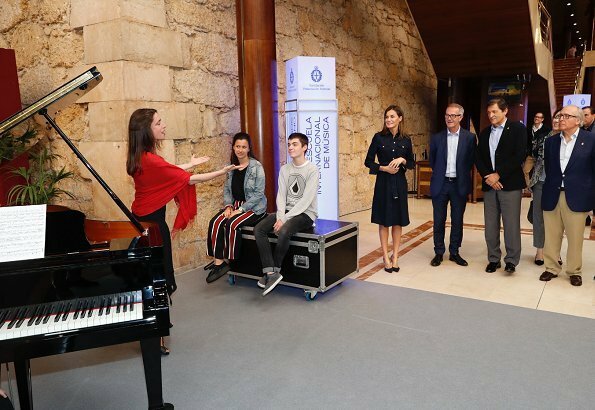 On July 26, 2018, Queen Letizia of Spain visited the International Music School 2018 Summer Courses of the Princess of Asturias Foundation (FPA), held at the Prince Felipe Auditorium in Oviedo. Within the framework of the Princess of Asturias Foundation International Music School Summer Courses, which are held between 19th and 28th of July, teachers and students offering a total of seventeen concerts. In her homeland, Asturias, cloudy, raining and 20C only as usual in the North of Spain...She must be thrilled.. Very, very nice. I think it looks smarter as well with the dark belt and the heels. Very elegant and smart look. Very nice dress simple but chic. Aunque sea el cinturón pudo tener colores españoles.... y más inteligente por un cinturón??? Inteligencia es otra cosa!! Sí, la tuya, sin duda la usas a chorros, jojo. Eso de llevar el cinturón con la bandera se considera una horterada en España..
“Smart”, en este caso, no significa “inteligencia”. Oh dear! Having been a victim to wrong translations myself, I think there are some expressions you cannot translate. "Smart" is one of them. Sólo en el tejido denim. El vestido de Letizia es de tipo camisero y el de Meghan es con falda de vuelo tipo años 50, aunque mal ajustado del busto y lleno de arrugas, siendo mucho más caro. Uno cuesta 180Euros y el otro 2.000Euros..
the polka dot dress worn in the USA by RL. These references to copying, are stale and lack depth. Anonymous 5:14, no air conditioning in Asturias, there max temperature was 20C...in the North of Spain it's not hot and it rains a lot...The Green Spain..
Do not think either woman (MM or Letizia) looked to the other for styling tips as these engagements occurred on the same day. Sencillez y elegancia son habituales en Letizia , me encantae ella , como va vestida y con la seriedad que cumple sus eventos. Pronto estara de vacaciones bien merecidas. Pretty earrings. She is a star who shines her own light. I totally agree with Franny. Teresa2424's comment was hilarious and made no sense. Muy guapa y sencilla, no se necesita más. Letizia s'habille en Carolina Herrera aussi, je ne vois pas pour quoi c'est ok pour elle de le faire et pas pour Meghan. Les deux sont belles ! Je ne vois pas que personne n'interdit à Meghan de s'habiller en CH. 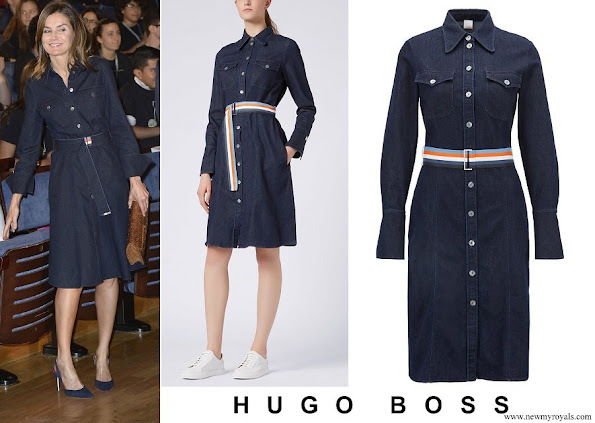 Seules les deux robes en denim, leurs formes et leurs prix ont été comparées. Et oui, les deux femmes sont belles et elles ont un style moderne et chic. Por fin Letizia se inspira en Melania y Megan, modernas a la vez que clásicas. ¿Cómo? Eso es un chiste, supongo... Letizia lleva 10 años de Princesa y 4 como Reina. Melania llegó anteayer y Meghan ayer, así que poco pueden enseñarle excepto gastar miles de $ en un solo vestido, así que NO, GRACIAS. Sólo hay que ver cómo vestía Leticia hasta "ayer". Es sabido que en 14 años no ha aprendido mucho. 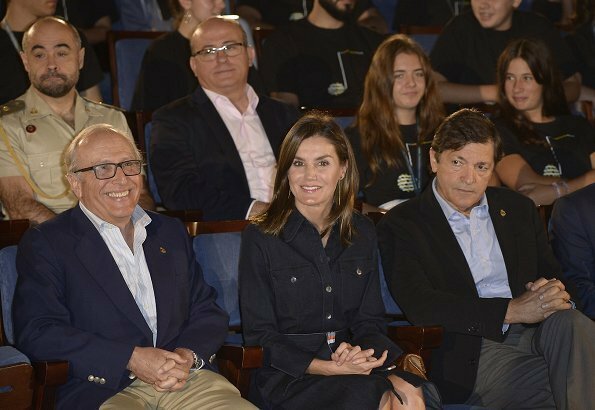 Sólo ahora, con la la Primera Dama y la Duquesa, Letizia se ve un poco más moderna, y no modernilla. y antes se fijaba en Angela Markel,ah no Merkel!!! o cómo es el tema...ha, ja..vaya tonterías hay q leer..
Aplicate el cuento porque no dices mas q necedades sobre España y su reina y no eres española, q se nota..
"Esa gente" sólo contesta a comentarios de "otra gente" de sobra conocida, que se explaya insultándola de la peor manera en otros sitios y piensa que de aquí se va a ir de rositas sin que nadie responda... Pues va a ser que no. Yo también pienso que va mejorando gracias a los outfits de Melania T y Meghan M. Ahora, va clásica pero más actualizada, moderna. General.ente resulta catetilla pero bueno, no pongáis el grito en el cielo. Melania is no one's muse. She may be held up as an icon in Europe, and even there, which woman can afford $5,000 dresses and $49,000. jackets to attend meetings and conferences? It is an urban legend mainly in the Spanish gossip press that her style is closely followed. In America she is seen more as a trophy wife. Meghan on the other hand is younger than the other two ladies and from a world of haute couture and urban chic in California. Her chosen style coincides with Letizia's. Letizia for her her part came with a work ethic, and in her head IMO she felt that the monarchy should be seen as working people who go out every day to meet the people for whatever reason. Blending the fashion of her old life with the new one did not go well with the people who expected jewels, flowers and designer outfits and vapid smiles. This year, the girls will take prominence. She has changed to a softer style because she is projecting the image of being someone's mother. Forty-something, stylish but still young. In addition, I think the people at CH have taken her under their wing and customize anything that she likes to her taste. It is a fact that her clothes are always beautifully tailored, even the 'hated' Varelas. I do not see women at this level looking to each other for style tips. Also they are all advised by stylists. @4:54, no seas paleta... en el mundo de la moda se puede ir vestida de manera clásica por corte, silueta o inspiración, pero con toques modernos que actualizan el concepto. El decir clásica y moderna no es igual que decir antigua y moderna, anda estudia un poco más la moda y vuelve a los blogs del mercado. Melanie is not held up as an icon , at least not in Scandinavia. About this discourse how these royal women imitate each others, I do not think so. Mostly they have their own styles, the only connecting thing is that there is only a certain number fashion houses and that makes they have to wear sometimes clothes like other ones. I think Camilla is the only one who has her clothes done just to her. Yo te recomendaría usar el diccionario y ver la definición de clásico y moderno, son antónimos por tanto no hay concepto que los aúne. Se ve que sabes mucho de moda, con las pautas que has dado todo el blog te va a contratar. This lady loves her Hugo Boss outfits... more than any other. It’s not a bad one, clearly trendy, but somehow I just don’t find it right. Denim to me is rarely applicable for anything but outdoors, sporty events. Yes, I knew, you will tell me it is ‘in’. I started with ‘it’s trendy’. It still doesn’t quite feel appropriate. But its ok, just that she can do casual better (plenty of examples in her previous appearances). Plus, the pairing with those shoes seems odd to me. Can’t get behind this look (and I am trying quite hard to like it).